My husband and I have been trying to be healthier, and of course a big part of that is making sure that our diet includes good for us foods that actually taste good. Easier said than done, right? 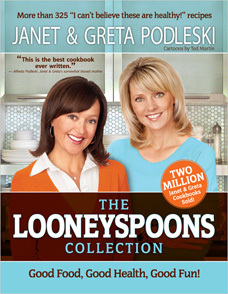 Well, I was very excited to get a copy of The Looneyspoons Collection: Good Food, Good Health, Good Fun! , because the title promises healthy, good, and fun, recipes! But it’s not just the recipes that make this book great, there is a lot more to it than meets the eye! Not only are there full color photos for most of the recipes (I do wish there had been a photo of each recipe), but there are tips and tricks, and information about why certain ingredients are good for you. Each recipe also have calorie and other information included, which I love to see. The titles of the recipes are all pretty funny, usually a pun or play on words. I liked that the recipes were divided up in clear ways, such as chicken, or vegetarian, and even a section for things that didn’t really have a section. They have made it easy to find too by color coding the pages in each section so you can easily find what you are looking for while you flip through the book. And yes, even though this is a healthy cook book, there are desserts! This is sure to become a favorite, go to recipe book, in our household. Next postEaster is early this year!